Automated fastening systems are used for screwing, riveting, and various other types of fastening/joining applications. 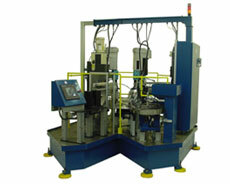 Automated fastening systems work with metal or plastic components and can join multiple flanged components. These systems are often used to assemble housings. Dial-X Automated Equipment, Inc. has the experience and flexibility to meet your exact fastening system needs. For further information or a free quote on automated fastening systems, contact Dial-X Automated Equipment, Inc.